We all have someone who is tough to shop for on our Christmas lists. At our house, James’s wish list takes me longer to get together than anyone else’s. So I thought I’d share what we came up with for this year and gifts he’s loved from years past. 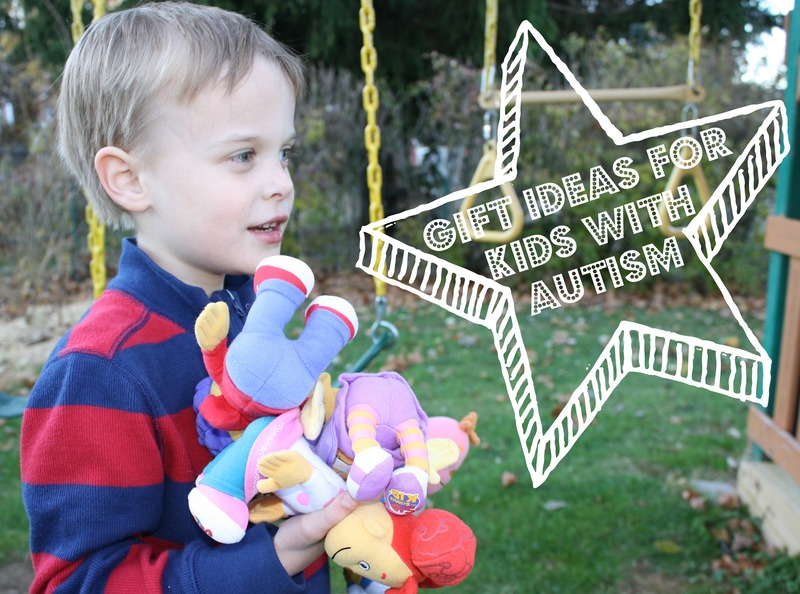 Maybe it will spark some ideas for special-needs kids in your life! Melissa and Doug Basic Skills board (affiliate link) – We love Melissa and Doug puzzles because they are durable and fun! James can use this one to practice skills like zipping zippers and buttoning buttons. Dora the Explorer Bath Squirters (affiliate link) – Bath time is play time for James so he’ll have lots of fun with Dora and Boots floating around. Old Navy Skinny Jeans – James is slim and these skinny jeans from Old Navy fit him better than any others we’ve tried. Melissa and Doug Deluxe Latches Board (affiliate link) – Another fun one from Melissa and Doug, this one will help James work on those fine-motor skills. Dr. Seuss book box set (affiliate link) – James needs new copies of two of his favorites and we want to introduce him to two in this box he doesn’t have. Pure Fun Kid’s First Jumper Trampoline (affiliate link) – We’ve been through a couple trampolines and this one is our favorite! Alex Toys Bathtime Fun Hoops (affiliate link) – James loves to play with balls, so we think he’ll love this basketball-type game for bath time. Old Navy Boy’s Lightweight Hooded Barn Jacket – James still sits in a car seat with a five-point harness, so he needs warm coats that aren’t too thick. This one looks perfect! (Currently out of stock, this one is similar). Pottery Barn Hungry Caterpillar Bedding – James loves The Very Hungry Caterpillar. He got these sheets last year and still loves them! We’re excited to see James open his gifts and play with his new toys! 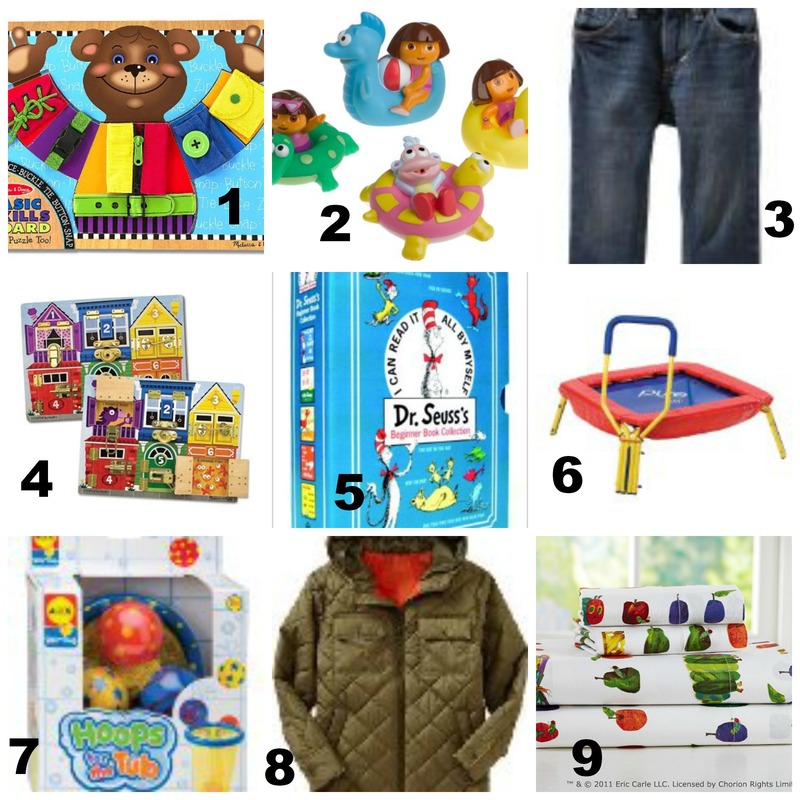 What’s our your kids’ Christmas list this year?